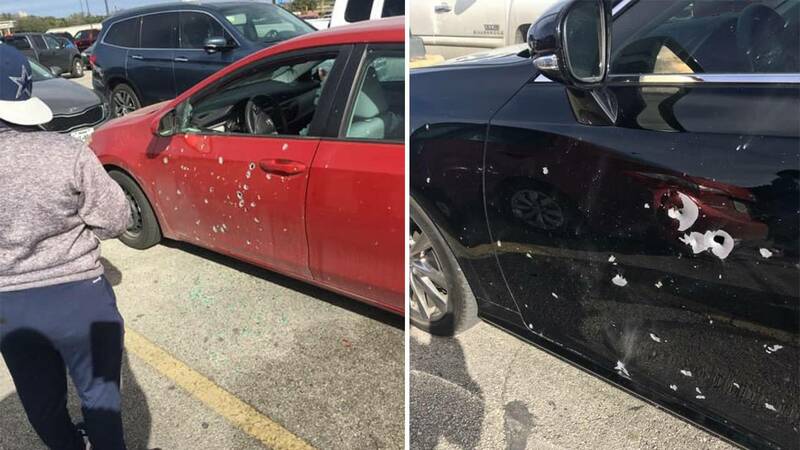 SAN ANTONIO - Authorities on Monday arrested a man who they said shot up two vehicles parked at a Far West Side Walmart earlier this month. Police linked Nikolos Marko Cruz, 24, to the Dec. 16 shooting using his date of birth, a partial license plate number, surveillance video and vehicle description, according to an affidavit for his arrest. Authorities obtained Cruz's birth date after Cruz was seen on surveillance video purchasing Winchester 7.62X39mm bullets from a Walmart in the 6700 block of West Loop 1604. An affidavit states the clerk took down Cruz's birth date for the ammunition purchase. After completing his purchase, he is then seen on surveillance video walking to a gray Toyota Camry with an older woman, court documents state. Shortly after, the shooting occurred. Witnesses told police Cruz pulled up next to a parked 2015 Toyota Corolla and opened his trunk, firing multiple shots from inside his trunk. The gunfire struck the Corolla and a 2015 Lexus Gs300, a police report states. An off-duty detective with the Bexar County Sheriff's Office took down a partial license plate for Cruz's vehicle, aiding authorities with their search for a suspect, according to an affidavit. After the shooting, authorities were able to piece together what information they had and identified Cruz as a suspect. Police put out a be on the lookout alert for Cruz, and on Christmas Eve, authorities contacted the detective investigating the case stating they arrested Cruz on firearms and narcotics charges, according to the affidavit. Police said Cruz confessed to shooting the vehicles. Cruz told police he was attempting to load his weapon with the ammunition he had just bought in the trunk of the car when he said the weapon "accidentally went off," court documents state. While witnesses told police they believed the weapon was an "automatic high-caliber" firearm, the affidavit does not state what kind of weapon Cruz used. Cruz told investigators he took off from the scene because he was "scared," as he knew he was not supposed to be in possession of a firearm since, according to the affidavit, he "was a convicted felon at the time of the offense." As police questioned him about the incident, he asked if anyone was hurt because he said he never checked the cars before he left. No one was in the vehicles at the time of the shooting, according to police. Online records show Cruz is being held on a charges of being a felon in possession of a firearm, possession of marijuana between 4 ounces and 5 pounds, possession with intent to distribute a controlled substance between 4 grams and 200 grams and deadly conduct.